The E2S ‘M’ series of Marine Beacon products have been designed to withstand the harshest of environments. Constructed from lightweight, impact and fire resistant ABS, the range features stainless steel, ratchet adjustable mounting brackets and has been third party tested to IP67. – Flash Rate: Multi-function, see flash pattern table below. – 3 stage alarm, remotely selectable. – Construction: Flame retardant ABS housing, glass lens. – Stainless steel guard as standard. – Lens Colors Available: Amber, Blue, Clear, Green, Red. ESS7512 MBL1 LED marine beacon, 10-50VDC, 400mA @ 24VDC, (specify lens color). 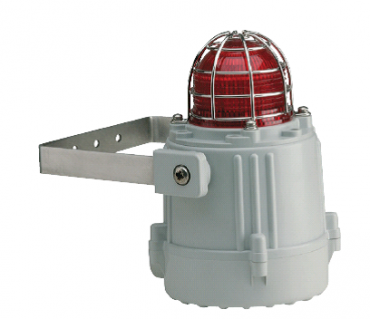 ESS7513 MBL1 LED marine beacon, 24VAC +/- 10%, 380mA, (specify lens color). ESS7522 MBL1 LED marine beacon, 115VAC +/- 10%, 140mA, (specify lens color). ESS7532 MBL1 LED marine beacon, 230VAC +/- 10%, 70mA, (specify lens color).